Thanks to Sony’s recent innovations exalting compact power in stills & motion cameras, the theme of 2014 will be “Small, Simple, 4K+36mp RAW power, & Nimble!” Combine the small 36 megapixel Sony A7R released last November with the just-announced Sony 4K FDR-AX100 Handycam, and one can build a monster stills+video rig–both handheld and tripod/monopod mounted, as pictured below. 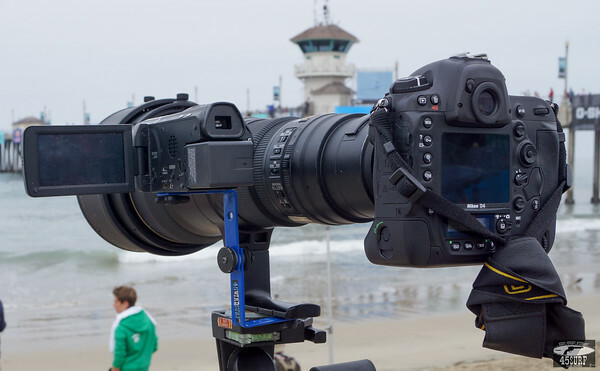 I am stoked to see that the upcoming Sony 4K Camera can shoot stabilized 4K video with an 18x zoom–ideal for capturing the world’s greatest surfers in 4K motion! Also stoked to try out the 128 fps for slow-motion captures of the pro’s wicked shredding & aerials. 11-time world-champ Ke11y Sl8r! This year we’ll shoot the champ in 4K motion! I’m psyched to be heading down to Australia to shoot men’s & women’s pro surfing Rip Curl Pro and Roxy Pro events in early March, and above please find a figure representing the nimble rig I’m assembling! It is comprised of the Sony A7R Full-Frame 36.4 MP + the Metabones Canon EF Lens to Sony NEX Smart Adapter + the Tamron SP 150-600mm f/5-6.3 Di VC USD Lens for Canon + the Manfrotto 694CX Carbon Fiber 4 Section Monopod (Black) + the 45surfer Stills+Video Bracket + Sony’s 4K FDR-AX100 Handycam camcorder with 18x 4K zoom (Clear Image 4K Zoom). If one browses my earlier versions of the 45surfer stills+video rig at https://45surfer.wordpress.com, http://blog.9shooter.com, and http://9shooter.com, one can see how awesome the Sony innovations make the rig! The 4K camcorder and small, light A7R full-frame complete it, providing unprecedented power in a compact form! And I’m quite psyched that the new Sony 4K camcorder will be replacing the HD Nex cameras I have been using for video! What would your ideal stills + video rig look like? Please comment below! As a side note, I don’t blog all that much, as I am too busy shooting, editing (minimal editing–Lightroom but no photoshop), and uploading! Part of it is that blogs and tweets seem so ephemeral, while photographs are forever, and I have always been drawn towards the permanent things. But as my photography is now averaging well over 1 million views a day (closer to two million views/day across all my social media/hosting properties! ), I figured I’d set up a blog and share some ideas. Enjoy some of my Nikon D4 + 600mm F4 Prime world champ Kelly Slater & Joel Parkinson photography! Imagine capturing 4K video alongside amazing stills of the world’s greatest! This year we’ll be rockin’ it! This entry was posted in Uncategorized and tagged &, 2014, 45SURFER, 4K+36mp, @ the, High, Motion, Nimble :), power, Quality, RAW, RIG: Small, Same, Shooting, Simple, Stills, Stills+Video, Time. on January 13, 2014 by physics astronomy galileo.